Colors and patterns – where to start? This article is a bit wordier than usual, but this topic can be complicated, and you can easily feel overwhelmed. Here are some of the ways we get the discussion headed in a productive direction. We suggest that you start collecting pictures, and put together an inspiration folder. This helps us identify the elements that appeal to your personal taste. 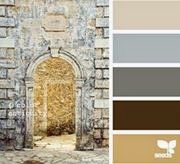 Once we determine the vision you have for your kitchen, we can help you put together a cohesive palette. Bring in samples of any existing materials that we are working with (like flooring or fabrics), as well as any items you have already chosen. Cabinets The next big visual impact in your kitchen space is the cabinetry. It will cover your walls from floor to ceiling. Your personal taste and your home’s décor will play a factor in this decision. Do you prefer a painted cabinet or stained? Are you drawn to a monochromatic color scheme, or is a more dramatic look your style? Is your home traditional or modern? Cabinetry today comes in many different wood species, which offers us a huge variety of stain colors to choose from, ranging from the darkest Espressos to the lightest of maples. And if you are considering a painted cabinet, there are many stock colors to choose from, including shades of white, gray and cream. And in the world of custom cabinets we can literally create or match any shade! Now, this is where we stop to have the talk about your kitchen’s Focal Point. We have a whole article devoted to this important concept! Countertop Though it’s not hanging on the wall at eye level like your cabinets, your countertop can make a big impression. Almost any material that you choose will offer many color and pattern options. Many man-made materials and natural stones have great patterns and multiple color options. This allows us to use the countertops as a unifying feature. A homeowner with dark wood floors, soft gray cabinets, and stainless steel appliances might choose a material that offers all these shades, and gives the kitchen a cohesive feeling. If the countertop is our focal point (there is that phrase again!) we would choose a color with more contrast, or a bolder pattern. If you are doing monochromatic color tones, then your countertop will likely be a solid color or very small pattern, in a coordinating shade. This is how we create that monotone, neutral background. Your countertop choice offers a great opportunity: Tying together the main colors in your kitchen. Backsplash Ok, we’re getting there! Next let’s talk about backsplashes. We are all familiar with the subway tile backsplash – a classic, neutral choice that will compliment any décor. But wait until you head to the Tilers place shop – the range of choices is amazing! Hopefully by this point you have a pretty firm design direction, and have decided on your focal point. This will take you in the right direction. Your backsplash is one of the last items to be installed, which allows you additional time to make your final choice. You can even begin using your new kitchen while deciding! Plan ahead – don’t wait until it’s time to order the cabinets, and then try to put together a cohesive palette! Give yourself the opportunity to explore a few different looks. You never know; with all the amazing options out there you may end up with a new direction!